1. What is the ratio of books in the Bible (i.e. Old Testament: New Testament)? 2. Where could you find the verse, passage in the Bible ‘Jesus Wept’? 3. According to Genesis 19:26, whose wife was turned into a pillar of salt when she looked back? 4. In Mark 10:46, what was the name of the blind beggar that Jesus healed on the highway outside Jericho? 5. Who was the son of Ruth and Boaz? 6. In Genesis 6:14, who was told, by God, to build an Ark? 7. In Judges 14:13, who was told to ‘put forth thy riddle’? 8. Which is the longest verse in the Bible? 9. According to Numbers 27:1, how many daughters did Zelophehad have? 10. According to Deuteronomy 34:1, And Moses went up from the plains of Moab to the mountain of Nebo, to the top of _____ peak? 11. According to Exodus 31:18, the Ten Commandments were written with ____? 12. Which book of the Bible comes after second Timothy? 13. Who was sent to the Potter’s house? 14. According to Genesis 2:10-14, which is NOT a river that parted from the Garden of Eden? Pishon, Euphrates, Gihon and Ephraim? 15. In John 11:35, whose death caused Jesus to weep? 16. According to 2 Samuel 4:8, And they brought the head of ____ unto David to Hebron? 17. According to 2 Kings 2:21, what did Elisha throw in the spring? 18. According to Matthew 5:16, Let your light so shine before men, that they may see your good works, and glorify your Father in _____? 19. In 2 Samuel 21:16, Who was Ishbibenob? Answer: One of the son’s of the giant. 20. In 1 Kings 7:21, what were the names of the two pillars in Solomon’s temple? 21. In Revelation 6:8, what was the color of the horse that was revealed when the fourth seal was opened? 22. According to 1 Chronicles 11:22, who went into a pit on a snowy day and killed a lion? 23. In what book do we find: ‘The Law of the Lord is perfect, converting (reviving) the soul? 25. According to Matthew 13:55, who are Jesus’s half brothers? Answer: James Joseph (Joses), Simon and Judas. 26. Which Bible verse says: I can do all things through Christ who strengthens me? 27. One Lord, One faith, One baptism’ is found in which book of the Bible? 28. Naomi had two daughters-in-law. What were their names? 29. According to Esther 9:14, how many of Haman’s sons were hanged on the gallows? 30. In Exodus 17, what tribe did God say He will war with for generation to generation? 31. In Genesis 5:18, who is the father of Enoch? 32. In Ecclesiastes 12:13, what is the whole duty of man? Answer: Fear God and keep his commandments. 33. What is the ninth book of the New Testament? 34. In 2 Samuel 17:1, which of David’s sons tried to claim his throne? 35. According to 1 Samuel 17:49, where did the stone that David hurled at Goliath hit him? 36. In 1 Samuel 17:1-2, where did David fight Goliath? 37. What is the name of the Mountain that Noah’s Ark rest on after the flood? 38. In Daniel 6:16, Daniel was thrown into what? Answer: A den full of lions. 39. In Acts 9:9, who went blind for three days on his journey to Damascus? 40. In 2 Timothy 4:13, Paul asked Timothy to bring him two things while imprisoned in Rome. What were they? Answer: A cloak and books. 41. What is the longest name mentioned in the Bible? 43. According to Deuteronomy 10:8, which of the twelve tribes of Israel did God choose to bear the ark of the covenant of the Lord? 44. According to Acts 1:15, how many people were present in the upper room on the day of Pentecost? 45. In 2 Samuel 4:4, who was Saul’s grandson to whom King David showed kindness? 46. In Genesis 7:4, how many days did it rain during the Great Flood? 47. According to Matthew 10:2-4, which of the following was NOT one of the original 12 apostles? 48. According to Genesis 6:10, how many sons did Noah have? 49. According to John 11:17, Lazarus was dead for how many days before Jesus raised him up? 50. According to Acts 20:4, where was Gaios from? 51. What is the total number of books in the Bible, in the Old and New Testaments? 52. What is the total number of books in the Old Testament? 53. Which is the earliest book of the New Testament? 54. Identify the Book of the New Testament which has: “What shall it profit a man, if he shall gain the whole world, and lose his soul”? 55. What is the total number of books in the New Testament? 56. When did the Authorized or King James Version of the Bible in English appear? 57. “What is truth”, said jesting Pilate; and would not stay for an answer’ – Thus begins Bacon’s essay ‘Of Truth’. Which Book of the Bible reports Pilate’s jest? 58. ‘As you sow, so you reap – this is originally a Biblical phrase, adapted, Whatsoever a Man Soweth, that shall he also reap’ being the text. Which Book does it belong to? 59. “Vanity of Vanities, saith the Preacher, vanity of vanities; all is vanity.” Which book of the Old Testament has this verse? 60. In which Book of the New Testament do you find this? “In my Father’s house are many mansions”? 61. ‘For dust thou art, and unto dust shalt thou return’. Which Book of the Old Testament has it? 62. Shaw’s play, ‘Back to Methuselah’, refers to the grandfather of Noah, who lived exceptionally long. How long? 63. One particular Bible is to be found most frequently in American hotel rooms. Which is it? 64. 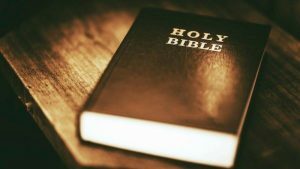 Which is the first complete translation of the Bible into English? Answer: By Wycliffe and his followers. 65. The New English Bible is not recognized by one of the Churches. Which? 66. ‘The Wicked Bible’ of 1631 is so called because it dropped a ‘not’ from one of the prohibitions of the Ten Commandments. Which is it? 67. The Seven Pillars of Wisdom’ by Lawrence of Arabia takes its title from the Bible. From where precisely? 68. Chaucer’s Wife of Bath is full of praise for King Solomon, ‘the wise King, daun Solomon’ who had wives more than one. How many women did Solomon have? Answer: 700 wives and 300 concubines. 70. What’s wrong with a fly in the ointment? The Bible tells you what: “Dead flies cause the ointment of the apothecary to send forth a stinking savour…” In which book does it do so?